Art from ‘Wonder Woman by George Pérez: Vol. 1″ by George Pérez, Bruce D. Patterson, and Tatjana Wood. 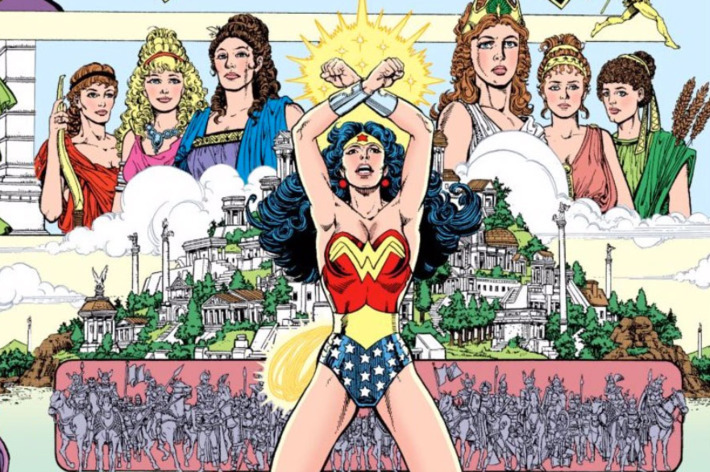 Gobbledygeek episode 344, “Wonder Woman by George Pérez: Vol. 1 (feat. Heather Wiley),” is available for listening or download right here and on iTunes here. In the winding, physics-defying halls of Mount Olympus, the idea for the noble Amazon race was hatched among the gods. In the presumably plain, ordinary offices of DC Comics circa 1987, the idea to reboot one of their most iconic heroes was hashed out by George Pérez, Greg Potter, Len Wein, Karen Berger, and more. And on this typically long, rambling podcast, Paul and Arlo continue this year’s superheroic Four-Color Flashback by discussing Wonder Woman by George Pérez: Vol. 1, collecting the first 14 issues of Diana’s post-Crisis series. Heather Wiley joins them to discuss how Pérez revitalized the character by leaning hard into her mythological aspects; why it’s important that the series touches on uncomfortable subject matter; the minute details that make Pérez such a terrific artist; and why this run hasn’t lodged its place in the public consciousness alongside The Dark Knight Returns and Man of Steel. Plus, Heather fails to keep quiet about Hush, and Paul reads comics. Next: we inch closer to oblivion with Wesley Mead, who joins us once more to discuss Chris Carter’s seminal sci-fi series The X-Files. This time? It’s season 9, the original final season. So. Yeah. This entry was posted in Four-Color Flashback, Shameless Self-Promotion and tagged action, adventure, batman, books, bruce d patterson, comic books, comics, crisis on infinite earths, dc, dc comics, fantasy, film, flash, george perez, gobbledygeek, graphic novels, greek mythology, green lantern, greg potter, horror, hush, itunes, john costanza, justice league, karen berger, len wein, libsyn, literature, movies, mythology, podcast, superhero, superheroes, superman, tatjana wood, wonder woman. Bookmark the permalink.